The Husqvarna ST224P – 24-Inch 208cc Two Stage Electric Start snow blower clears a 24 inch wide swath and up to 12 inch deep snow. It comes with heated handles and electric start to make using this machine more comfortable to use on extra cold days. In addition there is a powered steering feature which many consumers will appreciate especially if you have tight corners and small areas to work around. Description: The engine displaces 208cc, comes with power steering and electric start, a LED light, clears 24 inches width at a time, has a 180 chute rotation capability, heated grip handles, 12 inch ribbon augers, friction disc transmission, aluminum gearbox, large 15 inch tires and the gas tank holds up to 2.7 liters. There is a 3 year warranty on the machine and a 5 year warranty on the engine and gear box. This Husqvarna ST224P – 24-Inch 208cc Two Stage Electric Start has 24 reviews at the time of writing this review with an average rating of 4.7 out of five. 92% of the reviews are 4 or better which is quite good. There were no 1 star or 2 star ratings. Onee owner have had problems with the belts that drive the auger and impeller. There may be a technical bulletin to dealers about having the belts changed. The dealer picked up the machine and repaired it at no charge to the owner. 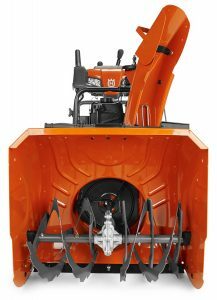 Consumers are very satisfied with shipping, unpacking and operation of this Husqvarna ST224P – 24-Inch 208cc Two Stage Electric Start snow blower. Note that if you have a large area to clear you may want something with a larger width of clearing than this one at 24 inches.